Once again, the New York Giants stood atop the standings as the most dominant team in the National League. Still reeling from the devasta ting loss in the previous World Series, they managed to take comfort in the less-than-stellar performance of their rival Philadelphia Athletics. 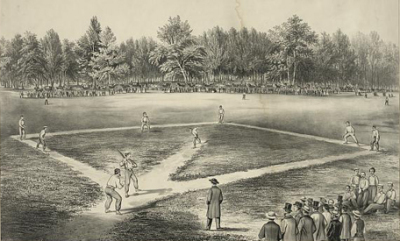 The two-time Champions were slated at the beginning of the season for a three-peat, but later fell to third place and finished fifteen games behind the pennant-winning Boston Red Sox. The Giants had a lot of other reasons to smile during the regular season as the left-handed ace, Rube Marquard set a long-standing Major League record by going undefeated in his first nineteen starts and later went on to finish with twenty-six wins. Veteran Christy Mathewson had twenty-three victories and rookie Jeff Tesreau had won seventeen games while leading the National League with an ERA of 1.96. At the plate, New York boasted solid performances by Larry Doyle, who batted .330, Fred Merkle, who had a .309 average and Chief Meyers who delivered a .358. Merkle and Doyle had combined for twenty-one home runs, and Red Murray led the team with ninety-two runs batted in. New York had won one-hundred three games and the National League pennant by ten games. Boston was also stacked after a magnificent year on the mound by Smoky Joe Wood, who had won thirty-four out thirty-nine games and pitched ten shutouts. Offensively, Tris Speaker had dominated the American League pitchers with a .383 batting average. Boston Manager Jake Stahl gave the Game 1 start to superstar Joe Wood while New York's John McGraw chose newcomer Jeff Tesreau over Series veterans Marquard or Mathewson. Rookies, even seventeen game winners, rarely started World Series openers, and it would prove to be a fatal mistake in the eyes of many Giants fans as Woods and the Sox took a 4-3 first game advantage. Game 2 was a roller-coaster ride as the Giants overcame a 4-2 deficit in the top of the eighth only to allow the tying run during the Sox's half of the inning. Memories of the previous Series, late game comebacks and losses to the A's, inspired the Giants to regain a 6-5 lead in the tenth. 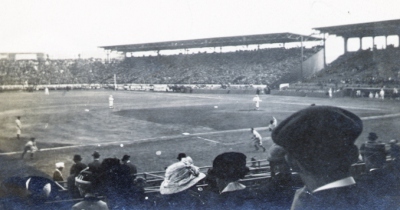 Boston was able to even the score in their next at bat and almost won after Tris Speaker hit what appeared to be an in-the-park homerun (after reserve catcher Art Wilson dropped the ball at the plate) but it was credited as a triple. 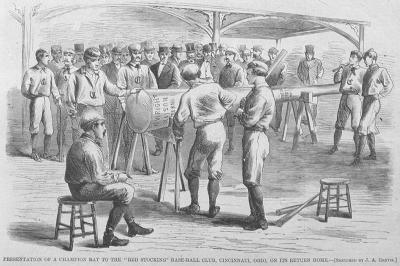 Neither team could break through in the eleventh inning and once again, a World Series game was called short and went into the books as a 6-6 tie due to darkness. The next day, Giant ace Rube Marquard lived up to his record-setting reputation and evened the Series with a 2-1 triumph. Despite his best efforts, New York's momentum would not last long. In a Game 4 rematch of the opener, Wood and Tesreau went at it again for another performance of "David vs. Goliath" as Smoky Joe out-dueled the young rookie in a 3-1 victory. Surprisingly, Boston decided to turn the tables for Game 5 by starting their own rookie ace, Hugh Bedient, a twenty game winner, against the Giants' veteran Christy Mathewson. This time, the story played out true as the Sox's "David" outmatched the Giants' "giant" with a 2-1 decision. Not wanting a repeat of last year's Series ending performance, the Giants came out in Game 6 with a renewed sense of urgency and knocked Boston starter Buck O'Brien for five runs in the first inning on their way to a must-win victory. A rejuvenated, New York carried the same momentum into Game 7, getting revenge on the undefeated Wood with six runs in the opening inning. With Marquard pitching a seven-hitter and Tesreau finally turning the tables on Wood, the Giants had won two crucial games by 5-2 and 11-4 scores. The best-of-seven battle would require the eighth game. Chasing away the demons from the previous year, New York had finally shown it's own tenacity and was ready to finish the job, but Boston wasn't ready to go home empty handed either. Once again, New York's John McGraw sparked some pre-game controversy after deciding to start Christy Mathewson, who was winless in his two previous appearances, for the Series finale. Not to be outdone, Boston started their own argument by selecting their twenty-two-year-old rookie Bedient, who had defeated Mathewson in Game 5 for the crucial start. Both teams went head-to-head for nine innings to a tense 1-1 standoff. Mathewson was still pitching for New York while Wood had taken over in the eighth for Bedient (who left the game in the seventh for a pinch-hitter, Olaf Henriksen, whose double had tied the score). In the tenth, New York's Red Murray knocked a one-out double and later scored on a Fred Merkle single. While Wood retired the side without further damage, the Red Sox were faced with trying to rebound from a 2-1 deficit. Desperate Giant fans had already started celebrating as Boston took their turn at an extra-inning comeback. Pinch-hitter Clyde Engle started the bottom half of the inning with a high fly ball to mid-centerfield. Fred Snodgrass stepped back to make the routine catch and accidentally dropped it. His teammates stood in disbelief as the tying run for Boston was now on second base. 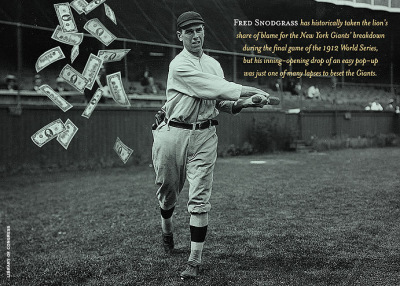 The visibly shaken Snodgrass was given the opportunity to "save face" on the very next play and shined with a spectacular catch off a Harry Hooper line-drive. Unfortunately, Engle had now advanced to third and was in prime scoring position. Steve Yerkes followed with a walk, and Tris Speaker sent Engle home for the tying run. With Yerkes stationed at third and Speaker on first with one out, Duffy Lewis was walked intentionally. Larry Gardner stepped up and belted a deep sacrifice fly to Josh Devore in right field while Yerkes tagged up and scored. The Red Sox had come back for a 3-2 victory and their second World Series championship. For the stunned Giants, it was their second consecutive defeat in the Fall Classic and an unbelievable finish to what had otherwise been a magical season.